HAL is a multi-disciplinary open access archive for the deposit and dissemination of sci- entific research documents, whether they are pub- lished or not. The documents may come from teaching and research institutions in France or abroad, or from public or private research centers. Making an application dependable demands that its functional and non-functional requirements be stringently fulﬁlled throughout its development process. In this context, a design-driven development approach has the key advantage of enabling requirements to be traced from their high-level design forms to the resulting executable artifact. However, because such approaches are mostly general purpose, they provide little design guidance, if any. This situation makes unpredictable the coherence and the conformance of an application with respect to its requirements. To address this situation, we propose an approach that leverages a design-driven development process dedicated to a speciﬁc paradigm. This approach guides the veriﬁcation of the coherence and conformance of an application throughout its development. We demonstrate the beneﬁts of our approach by applying it to a realistic case study in the avionics domain. Dependability of a system is the ability to avoid service failures that are more frequent and more severe than is acceptable [Avizienis et al., 2004]. This generic concept includes attributes such as availability, integrity and reliability. De- pendable systems are now pervasive in a range of domains (e.g., railway, avionics, automotive) and require a certiﬁcation process. The main goal of certiﬁcation is to demonstrate that a system is conform to its high-level requirements, resulting from functional and safety analyses. Software plays an increasingly important role in dependable systems; software development is thus required to be certiﬁed. In particular, the stakeholders have to pay attention to the coher- ence of the functional and non-functional aspects of an application to demonstrate the conformance of the software with the high-level requirements. Non-functional aspects of a system refer to con- straints on the manner in which this system imple- ments and delivers its functionality (e.g., perfor- mance, reliability, security) [Taylor et al., 2009]. Coherence. Because functional and non-functional aspects are inherently coupled, ensuring their coherence is critical to avoid unpredicted fail- ures [Littlewood and Strigini, 2000]. For example, fault-tolerance mechanisms may signiﬁcantly de- teriorate the application performance. Generally, this kind of issues are detected at the late stages of the development process, increasing the devel- opment cost of applications [Amey, 2002]. Conformance. Ensuring that an application is in conformance with its high-level requirements is typically done by tracing their propagation across the development stages. In practice, this process is human-intensive and error prone because it is performed manually [Lasnier et al., 2009]. functional dimensions. We use the DiaSpec language to describe both functional and non- functional aspects of an application and apply this approach to a realistic case study. A DiaSpec description is veriﬁed at design time for coherence of its declarations. This veriﬁcation is performed with respect to a formal model generated from a DiaSpec description. of the high-level requirements cannot be ensured at design time (e.g., time-related performance), we provide further testing support to validate the implementation with respect to these remaining requirements. This support leverages a realistic ﬂight simulator, namely FlightGear [Perry, 2004]. We ﬁrst present an overview of the DiaSuite development methodology. Then, we introduce the working example used throughout this paper, namely an application for aircraft ﬂight guidance. DiaSuite is a design-driven development methodol- ogy dedicated to the SCC paradigm [Cassou et al., 2011]. 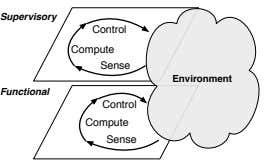 This paradigm originates from the Sense/- Compute/Control architectural pattern, promoted by Taylor et al. [Taylor et al., 2009]. This pattern ideally ﬁts applications that interact with an ex- ternal environment. Such applications are typical of domains such as home/building automation, robotics, automotive and avionics. As depicted in Figure 1, this architectural pat- tern consists of three types of components: (1) entities correspond to devices, whether hardware or software, and interact with the external en- vironment through their sensing and actuating capabilities; (2) context components reﬁne (ﬁlter, aggregate and interpret) raw data sensed by the entities; (3) controller components use this reﬁned information to control the environment by trigger- ing actions on entities. From a DiaSpec description, a programming framework is generated to guide and support the programmer (stages ➁ and ➂ in Figure 2). 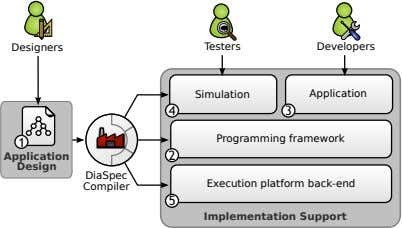 Addi- tionally, the DiaSpec compiler generates testing support, targeting a simulator speciﬁc to a given domain (stage ➃ in Figure 2). Finally, DiaSuite oﬀers support for deploying an application using several distributed systems technologies such as Web Services, RMI and SIP (stage ➄ in Figure 2). More details about DiaSuite can be found in our previous publications [Cassou et al., 2009,Cassou et al., 2011]. Req1. The execution time of the functional chain associated with the heading mode must not exceed 650 ms. Req2. The freshness of the navigation data used by the application must be less than 200 ms. Req3. The malfunction or failure of a sensor must be systematically signaled to the pilot, within 300 ms. Req4. A navigation mode should be deactivated safely if a sensor involved in its computation fails. Translating these requirements into a coherent design and ensuring their traceability across the development process is mandatory for the certiﬁ- cation, strongly suggesting an integrated design- driven development methodology like DiaSuite. dependable SCC applications and the validation support generated at the design stage. These con- tributions are illustrated with the heading mode of the ﬂight guidance application, introduced in Section 2.2.
application into the logic of the functional plane and the supervision of the non-functional aspects. When a non-functional situation is detected at the functional layer (e.g., a device failure), an event is raised, giving control to the supervisory layer. This layered design allows to factorize the su- pervisory treatments such as error recovery. For example, the Req4 requirement entails to deac- tivate the navigation modes that rely on faulty sensors. In this case, if a navigation sensor fails, an event (i.e., an error) is raised, giving control to a supervisory chain of operations, aimed to deactivate the dependent navigation modes. The design of the ﬂight guidance application can thus be decomposed into several functional and supervisory chains: one functional chain for each navigation mode and one supervisory chain for each supervisory treatment (e.g., reconﬁgura- tion, logging, pilot warning). In the rest of this section, we focus on the functional chains of the heading mode and the supervisory chain dedicated to deactivating the dependent navigation modes. Following the SCC paradigm, the DiaSpec design language provides speciﬁc declarations for entities, context and controller components. An entity is deﬁned as a set of sensing and actuating capa- bilities. Figure 4 presents the taxonomy of the entities used by the heading mode of the ﬂight guidance application. The IRU entity senses the position, the heading and the roll of the plane from the environment, as indicated by the source keyword. The NavMMI entity abstracts over the pilot interaction and directly provides the target heading set by the pilot. The Aileron entity provides the Control interface to act on the en- vironment, as indicated by the action keyword. The high-level nature of the entity declaration facilitates the integration of Commercial Oﬀ-The- Shelf (COTS) components: any implementation complying with the entity declaration can be used by an application. This design can be enriched with QoS and error-handling declarations. For example, in Fig- ure 4, the IRU entity is declared as raising an error of type FailureException. Figure 4 spec- iﬁes that the IRU entity produces the heading information with a frequency of 200 ms. For more details about these non-functional declarations, the reader can refer to previous publications [Mer- cadal et al., 2010,Gatti et al., 2011]. current plane roll (i.e., its rotation on the longi- tudinal axis) given by the IRU entity, the Target- Roll context component computes a target roll. This target roll is used by AileronController to control the ailerons and reach the target heading. The speciﬁcation of an SCC component is il- lustrated in Figure 5. This DiaSpec fragment declares the IntHeading context component as producing an intermediate heading of a Float type from values of two input entities, declared with the source keyword. The control ﬂow of this process is speciﬁed by an interaction contract introduced by the interaction clause. It declares that, when IntHeading receives a heading infor- mation from the IRU entity, it may access the targetHeading value provided by the NavMMI en- tity. The always publish clause speciﬁes that the context systematically publishes a value once it receives a heading information. Alternatively, a context component can be declared as either maybe or never publishing a result. In the interaction contract of IntHeading, the response time of NavMMI has to be at most 100 ms. The [mandatory catch] annotation in- dicates that the IntHeading context must com- pensate the errors when accessing targetHeading data. In contrast, the [skipped catch] annota- tion indicates that a context is not allowed to handle the errors. Figure 6 summarizes the design of the heading mode by a data-ﬂow directed graph, where a node is an SCC component and the edges indicate data exchange between the components. This ﬁgure shows another QoS declaration: a Worst Case Ex- ecution Time (WCET) is speciﬁed on the Aileron controller to cope with the Req1 requirement. Alongside the application logic, supervisory treatments can be speciﬁed in DiaSpec using sep- arate SCC chains. In the avionics domain, these treatments typically involve monitoring the appli- cation and triggering reconﬁgurations, as required by the Req3 and Req4 requirements expressed in Section 2.2. Speciﬁcally, these treatments allow to (1) inform the pilot in case of a device failure or unavailable data, (2) deactivate the modes that de- pend on unavailable data, and (3) log information for maintenance purposes. For example, the right part of Figure 6 depicts the supervisory chain cor- responding to the deactivation of the dependent navigation modes. These supervisory chains are speciﬁed with respect to non-functional information deﬁned in the taxonomy and the application design. For instance, errors raised by entities or violations of timing constraints are used as sources of informa- tion for the supervisory treatments. In Figure 6, the availability of IRU data is checked through the DataAvailability context component and is then used by the ModeController component to enable/disable navigation modes and deactivate the faulty sensors. allowing the early veriﬁcation of coherence and conformance. Unlike our previous work [Cassou et al., 2011], we now generate models expressed with timed automata, capturing time-related dec- larations. A DiaSpec speciﬁcation is translated into a network of timed automata where each automaton describes the behavior of a DiaSpec component. 2 The resulting network of timed au- tomata allows to verify safety properties using model-checking techniques. Here, we use UP- PAAL, an integrated tool environment dedicated to modeling, validation and veriﬁcation of net- works of timed automata [Behrmann et al., 2004]. To illustrate this early veriﬁcation process, we present examples of coherence and conformance veriﬁcations on the design of the ﬂight guidance application. 2 A detailed presentation of this translation can be found at http://diasuite.inria.fr/validation. heading data published every 200 ms by the IRU entity. 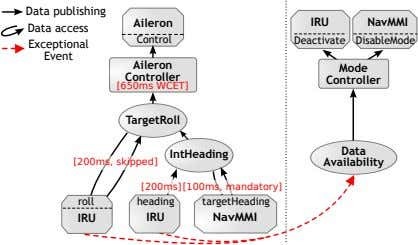 This veriﬁcation has led us to enrich the design with a timing constraint indicating that the response time of NavMMI has to be at most 100 ms. A more complex example is the interac- tion between the TargetRoll context component and the IRU entity. A deadlock is detected when the pulling process takes more than 300 ms. The shortest counter-example includes three data re- quests and thus cannot be easily identiﬁed by hand. Conformance veriﬁcation. We use properties based on temporal logic to express high-level requirements and check them on the design of the application. The UPPAAL model checker relies on a subset of TCTL (Timed Computa- tion Tree Logic) [Henzinger et al., 1994]. An example of TCTL properties is “IRU.Failure NavMMI.DisableMode”, corresponding to the Req4 requirement. When the IRU automaton is in the IRU.Failure state, the NavMMI automa- ton will eventually be in the NavMMI.DisableMode state, which corresponds to the deactivation of the navigation modes that depend on the IRU sensor. Even if conformance and coherence cannot be fully guaranteed at design time, providing such validation support guides the design with regard to the high-level requirements. Indeed, when a property is not satisﬁable, a counter-example is generated by UPPAAL, helping the designer to improve the DiaSpec speciﬁcation. Moreover, our generative approach ensures that the implemen- tation is conform to the design, preserving these properties in the subsequent stages of the devel- opment process. guides the developer by providing high-level op- erations for entity binding and component inter- actions. Additionally, our strategy to generate an abstract class relies on the Java language and its type system to enforce the declared interaction contracts. As shown in Figure 8, when extend- ing the AbstractIntHeading abstract class, the developer is required to implement the onHeading- FromIRU abstract method to receive a value pub- lished by this device. In addition to this value, this method is passed support objects to request data from a device (binding). requesting the targetHeading data from NavMMI. As shown in Figure 8, this mandatory error han- dling is enforced by introducing a continuation parameter in the method supplied to the devel- oper to request the targetHeading data (i.e., getTargetHeading). This continuation provides a default value in case of an error. Timing constraints speciﬁed at design time are also traceable in the generated programming framework. Indeed, these constraints are auto- matically monitored in the programming frame- work [Gatti et al., 2011]. For instance, this mon- itoring layer measures the time spent by the IntHeading context component to retrieve the targetHeading data. If this time is greater than 100 ms (as speciﬁed in Figure 5), an error is auto- matically raised by the framework. As shown in Section 3, the supervisory treat- ments are handled independently from the func- tional treatments. This separation of concerns allows a developer to focus on a speciﬁc non- functional aspect. For example, the developer of the DataAvailability context component can concentrate on implementing algorithms to detect data availability. Because of the programming framework support, the developer does not need to mix supervisory operations, to detect and han- dle errors, with the functional treatments. The implementation of each SCC chain can be tested independently. For example, the functional aspect of the application can be tested using a simulated external environment. The taxonomy deﬁnition allows to validate the functional imple- mentation using mock-up entities that rely on the simulated environment. This is done without any impact on the rest of the application. namely FlightGear [Perry, 2004], to simulate the external environment. Using a Java library that interfaces with Flight- Gear, the testers can easily implement simulated versions of entities. Figure 9 presents an extract of the implementation of a simulated IRU. The SimulatedIRU entity is implemented by inheriting the AbstractIRU class, provided by the programming framework. To interact with the simulated environment, the entity implements the SimulatorListener interface. This interface de- ﬁnes a method named simulationUpdated, which is called periodically by the simulation library. The model parameter allows to read/write the current state of the FlightGear simulator. In Figure 9, the position of the plane is published by calling the publishPosition method of the AbstractIRU class. port eases the veriﬁcation of the conformance with the requirements such as the Req3 requirement presented in Section 2.2 Finally, it is required to realize integration test- ing on a test bench to ensure that the application behaves correctly for a speciﬁc deployment conﬁg- uration. An advantage of our simulation support is that simulated and real entities can be com- bined in a hybrid environment. Indeed, as both real and simulated versions of an entity extend the same abstract class, the nature of an entity has no impact on the rest of the application. Deploy- ing an application on a test bench is a daunting task that has to be repeated each time an error is detected. Testing by simulation may avoid some unnecessary deployments. 3 The DiaSpec speciﬁcation and a video demonstrat- ing this application are available at http://diasuite. inria.fr/avionics/ardrone. matically preserved thanks to the generated pro- gramming framework. Indeed, the support gen- erated for error handling, such as in the Data- Availability context component presented in Section 4, prevents developers from implementing ad-hoc code for error propagation. Concerning the QoS declarations, the generated support con- sists of monitors integrated in the programming framework. These guards do not ensure coherence by themselves but guide the coherence veriﬁcation at runtime. Indeed, when a QoS contract is not fulﬁlled, a speciﬁc exception is raised, pinpointing the involved component. To ensure the conformance with respect to the high-level requirements, we provide validation sup- port along the development process. We illustrate how this support guides the conformance veriﬁca- tion using the Req3 requirement. This require- ment indicates that the malfunction or failure of a sensor must be systematically signaled to the pilot, within 300 ms. At design time, this requirement leads to the speciﬁcation of an SCC supervisory chain dedi- cated to the signaling of the failure to the pilot. The early-veriﬁcation support presented in Sec- tion 3 allows to statically verify that an excep- tional event raised by the IRU entity systematically results in the triggering of the Display action on the NavMMI entity. At implementation time, the generation of a programming framework ensures the confor- mance of the application with the data and control ﬂow speciﬁcations as demonstrated in previous work [Cassou et al., 2011]. However, the time- related aspect of the Req3 requirement cannot be veriﬁed at design time as it depends on runtime speciﬁcities (e.g., the properties of the execution platform). To ease the veriﬁcation of such re- quirements, the programming framework provides dedicated monitors to detect the violation of the time-related constraints during the testing stage. Moreover, the generated testing support provides error-injection capabilities, allowing to validate the Req3 requirement, even if the IRU entity is not yet implemented. Several design-driven development approaches are dedicated to dependable applications. 4 The Error Model Annex is a standardized AADL extension for the description of errors [Vestal, 2005]. real-time systems. To allow the formal veriﬁca- tion of a whole mechatronic system, the authors propose to develop a library of coordination pat- terns that deﬁne speciﬁc component roles, their interactions and real-time constraints. Then, the components of the application are built using this library of patterns by specifying their roles and ad- ditional behavior details. The approach comprises tool support for the speciﬁcation, veriﬁcation and source code synthesis as a plug-in for the Fujaba tool suite [Burmester et al., 2005]. The use of coordination patterns can be seen as a paradigm that guides the design of mechatronic systems. Contrary to ours, their approach does not pro- vide support for error handling but focuses on the time-related aspects. Another development methodology for depend- able applications is SCADE (Safety Critical Ap- plication Development Environment) [Dion, 2004]. SCADE is based on a synchronous language and relies on hierarchical state machines for the speci- ﬁcation of dependable applications. An applica- tion is speciﬁed using state machines, enabling the veriﬁcation of coherence at design time. The synchronous paradigm ensures by construction the determinism of a speciﬁcation, and thus eases these veriﬁcations. The approach abstracts over physical time allowing real-time properties to be veriﬁed at the code level. Our design methodology is similar to this approach but lifts constraints inherent to the determinism of the speciﬁcation. SCADE could be used to specify more precisely the internal behavior of critical DiaSpec compo- nents. In this paper, we have shown the beneﬁts of the DiaSuite methodology for the development and the veriﬁcation of dependable applications. We have applied this methodology to a realistic case study in the avionics domain and covered the entire development process, from design to testing, leveraging an existing ﬂight simulator. reusing existing avionics deployment technologies to provide deployment support. Amey, P. (2002). Correctness by Construction: Better Can Also Be Cheaper. CrossTalk: the Journal of Defense Software Engineering, 2:24–28. ARP-4761 (1996). ARP-4761, Guidelines and Methods for Conducting the Safety Assessment Process on Civil Airborne Systems and Equipment (SAE). Behrmann, G., David, A., and Larsen, K. (2004). A Tutorial on Uppaal. Formal methods for the design of real-time systems, pages 33–35. Burmester, S., Giese, H., Hirsch, M., Schilling, D., and Tichy, M. (2005). The Fujaba Real-Time Tool Suite: Model-Driven Development of Safety- Critical, Real-Time Systems. In ICSE’05: Pro- ceedings of the 27th International Conference on Software Engineering, pages 670–671. ACM. Cassou, D., Balland, E., Consel, C., and Lawall, J. (2011). Leveraging Software Architectures to Guide and Verify the Development of Sense/Com- pute/Control Applications. In ICSE’11: Pro- ceedings of the 33rd International Conference on Software Engineering, pages 431–440. ACM. Cassou, D., Bertran, B., Loriant, N., and Consel, C. (2009). A Generative Programming Ap- proach to Developing Pervasive Computing Sys- tems. In GPCE’09: Proceedings of the 8th In- ternational Conference on Generative Program- ming and Component Engineering, pages 137– 146. ACM Press. Cassou, D., Bruneau, J., Consel, C., and Balland, E. (2011). Towards A Tool-Based Development Methodology for Pervasive Computing Applica- tions. Software Engineering, IEEE Transactions on, PP(99). Dion, B. (2004). Correct-By-Construction Methods for the Development of Safety-Critical Applications. SAE transactions, 113(7):242–249. Proceedings of the European Real Time System conference. Toulouse, France. Feiler, P. (2006). The Architecture Analysis & Design Language (AADL): An Introduction. Technical report, DTIC Document. Time Systems. Inf. Comput., 111(2):193–244. Hugues, J., Zalila, B., Pautet, L., and Kordon, F. (2008). From the Prototype to the Final Embed- ded System Using the Ocarina AADL Tool Suite. ACM Transactions on Embedded Computing Sys- tems, 7:1–25. Lasnier, G., Zalila, B., Pautet, L., and Hugues, J. (2009). OCARINA: An Environment for AADL Models Analysis and Automatic Code Generation for High Integrity Applications. Reliable Software Technologies–Ada-Europe 2009, pages 237–250. ICSE’00: Proceedings of the Conference on The Future of Software Engineering, pages 175–188. ACM. Mercadal, J., Enard, Q., Consel, C., and Loriant, N. (2010). A Domain-Speciﬁc Approach to Architec- turing Error Handling in Pervasive Computing. In OOPSLA’10: Proceedings of the Conference on Object Oriented Programming Systems Lan- guages and Applications, volume 45, pages 47–61. FMSP’98: Proceedings of the Second Workshop on Formal Methods in Software Practice, pages 44–53. ACM. Perry, A. R. (2004). The FlightGear Flight Simulator. In Proceedings of the USENIX Annual Technical Conference. Shaw, M. (1995). Beyond Objects: A Software Design Paradigm Based on Process Control. SIGSOFT Software Engineering Notes, 20:27–38. Taylor, R. N., Medvidovic, N., and Dashofy, E. M. (2009). Software Architecture: Foundations, The- ory, and Practice. Wiley Publishing. ture Analysis & Design Language (AADL) Error Model Annex. In AADL Workshop. Technology, Engineering, Management. John Wi- ley and Sons Ltd.
SMC-IT’09: Proceedings of the 3rd IEEE Inter- national Conference on Space Mission Challenges for Information Technology, pages 13–20. IEEE.